Material: Hard Stone (Cornelian), 15k gold tested. 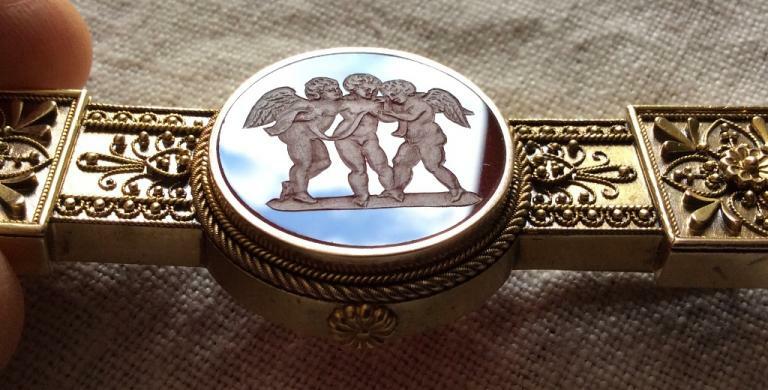 Size: 3 1/8" by 1 2/8" cameo itself is about 1" in diameter. 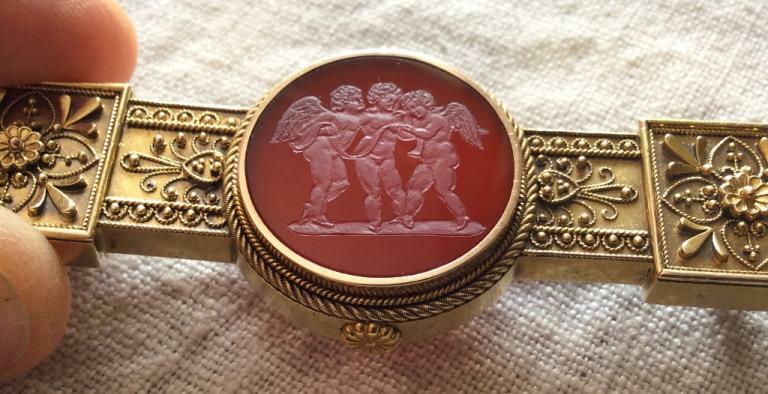 This is a rarest and Museum Quality cameo brooch carved on hard stone, Cornelian quality, depicting the Three Genii of Music Singing. The subject is after a sculpture by Bertel Thorvaldsen now in the Museum of Stockholm, see pictures below. 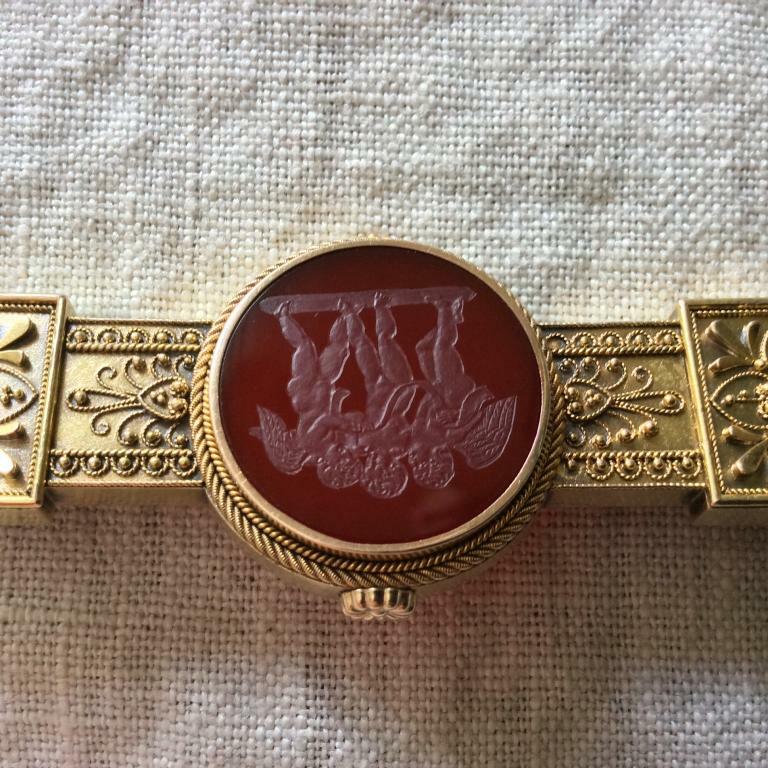 The subject is delicately carved on the stone and it can resemble an Intaglio but it is not. 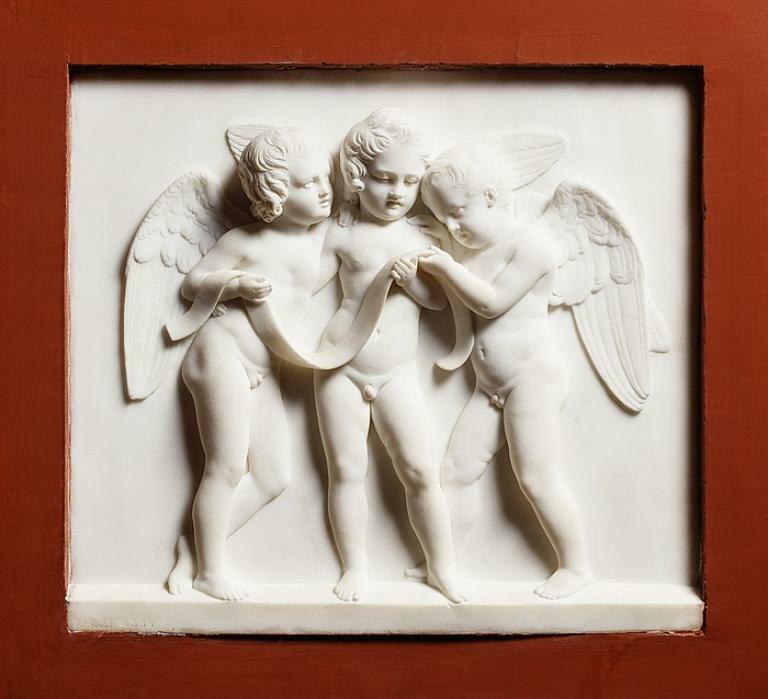 The three cherubs are superbly and finely carved and the original artwork was respected in every detail. 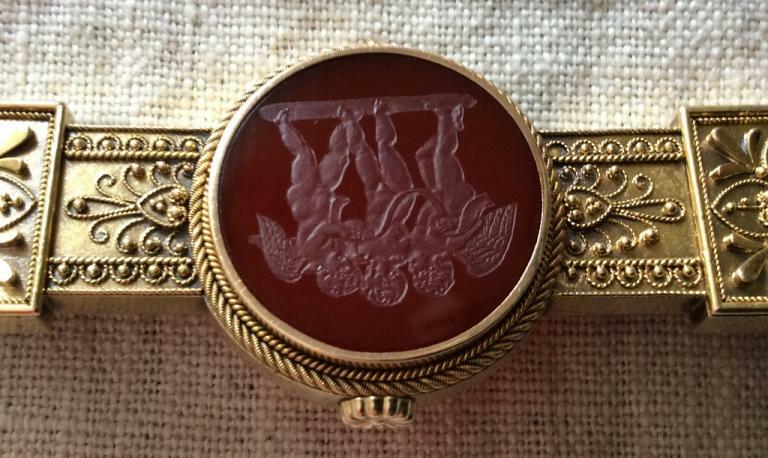 The frame is another superb artwork, made in Etruscan Revival style and very elaborate, a real rarity. This is another great treat for any collector, to not to miss. 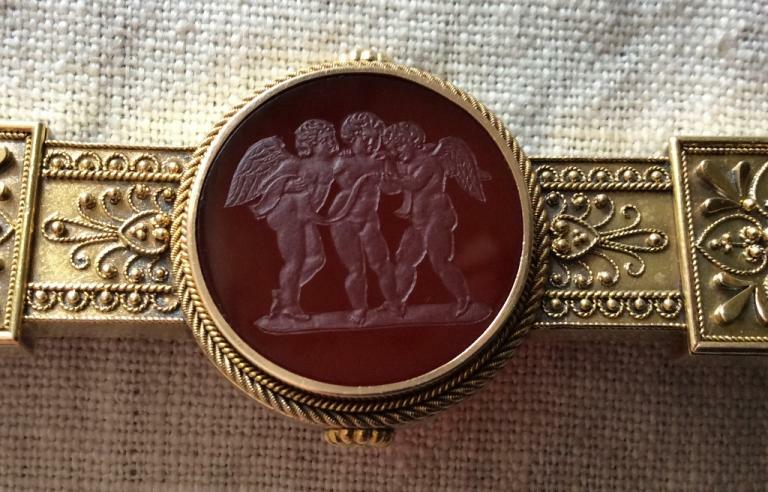 In Roman religion, the genius (Latin: plural geniī) is the individual instance of a general divine nature that is present in every individual person, place, or thing. Much like a guardian angel, the genius would follow each man from the hour of his birth until the day he died. Genius is very often depicted as a winged baby (cherub). For women it was the Juno spirit that would accompany each of them. The Greeks called their genii daemons, and believed in them from the earliest times. The rational powers and abilities of every human being were attributed to their soul, which was a genius. Each individual place had a genius (genius loci) and so did powerful objects, such as volcanoes. The concept extended to some specifics: the genius of the theatre, of vineyards, and of festivals, which made performances successful, grapes grow, and celebrations succeed, respectively. It was extremely important in the Roman mind to propitiate the appropriate genii for the major undertakings and events of their lives. Although the term genius might apply to any divinity whatsoever, most of the higher-level and state genii had their own well-established names. Genius applied most often to individual places or people not generally known; that is, to the smallest units of society and settlements, families and their homes. Houses, doors, gates, streets, districts, tribes, each one had its own genius. 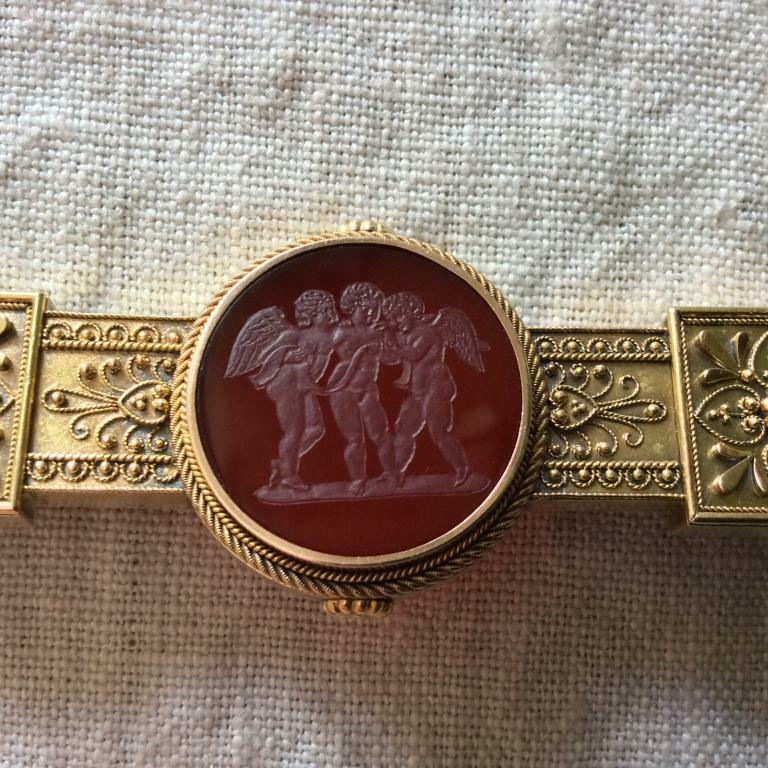 The supreme hierarchy of the Roman gods, like that of the Greeks, was modelled after a human family. It featured a father, Jupiter , who was also the supreme divine unity, and a mother, Juno, queen of the gods. These supreme unities were subdivided into genii for each individual family; hence, the genius of each female, representing the female domestic reproductive power, was a Juno. The male function was a Jupiter. Genii were often viewed as protective spirits, as one would propitiate them for protection. For example, to protect infants one propitiated a number of deities concerned with birth and childrearing: Cuba ("lying down to sleep"), Cunina ("of the cradle") and Rumina ("of breast-feeding"). Certainly, if those genii did not perform their proper function well, the infant would be in danger.